Allowing employees to interact outside of a structured environment allows personalities to be displayed in a way that may surprise you! You can learn a lot about a person by watching them play a game of shuffleboard! Do they respond well to adversity? Do they work well under pressure? Do they communicate effectively with teammates? These are all interesting questions that can be applied to your business as well. Research has shown that men and women communicate differently. While women favor direct communication, men tend to engage better indirectly. This may provide a great time for male workers to open up and learn about one another. Perhaps you will share a story that happened to you before or you may learn about another person’s family life. A relaxed and leisurely activity can permits individuals with the chance to get to know each other outside of the confines of work without the stress to remain “professional.” You may be excited to see what you find out about your neighbor in the cubicle next door! Engaging in a game where individuals are focused on a shared goal builds trust and cohesion among coworkers. After all, a group of business associates operates much like a team where each individuals is given a specialized task. They are expected to hold up their end of the bargain in order to help the rest of the team inch closer to the larger objective! Participating in a team event that allows employees to engage outside of their cubicle can facilitate bonds that would not have been discovered otherwise. Completing a project by its deadline can mirror the stress of hitting the game winning shuffleboard shot! 3. What’s Wrong With a Little Friendly Competition? Try pitting your Sales Team against the Customer Service Department and watch dazed workers come alive! Even if you have to teach the group the rules of shuffleboard, serious bragging rights are at risk here! The competitive nature of a simple game can mimic the real-world objectives of beating last year’s sales goals. The pressure of competition brings out the best in your work and builds resilience as we learn to adopt and overcome obstacles to attain long-term goals. 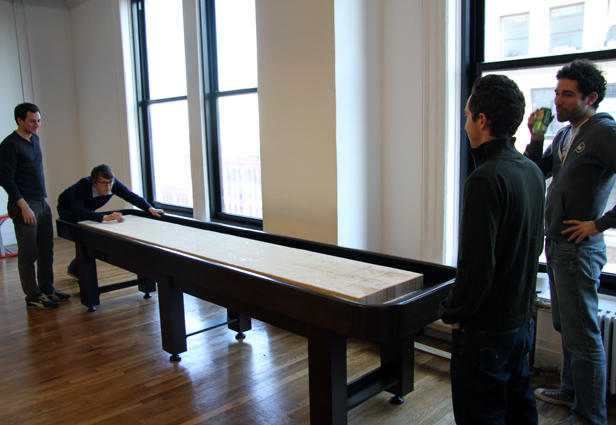 The 9′ Astro Shuffleboard Table. More info. A cordial game of shuffleboard can carry over into the workplace and encourage coworkers to push each other to improve on a daily basis. Be creative! You can even try creating a weekly (or monthly) shuffleboard tournament to see who gets dibs on the best parking spot, the “good chair” in the office, or a cup of coffee made by the loosing team! A competitive game can inspire individuals to dig deep down in hopes of defending egos and saving face. Shuffleboard is fun, exciting, and it’s simple enough to teach in a short period of time so you won’t have to take too much time off of work for fun and games! As we all know, sitting at the desk for hours upon end can lead to stiff necks, irritated eyes, and cramped muscles. While a game of shuffleboard cannot take the place of traditional physical activities, it can serve supplemental purposes and help get the blood (and ideas) flowing! Shuffleboard can help stimulate the mind! Image via Telegraph UK. Physical movement encourages blood flow throughout the body. When playing a game of shuffleboard, players are required to bend at the knees, use core muscles, and employ various strategies to win. Shifting the brains focus and allowing your attention to hone in on an entertaining game will induce adrenaline that will stimulate the brain naturally without feeling like you’re at your wits end. Change the pace in the office to improve cognitive ability and increase productivity! Now you may be thinking, do we have enough space in the office for this? Shuffleboards come in various sizes. You can choose the right fit according to how much real estate you have in the office. 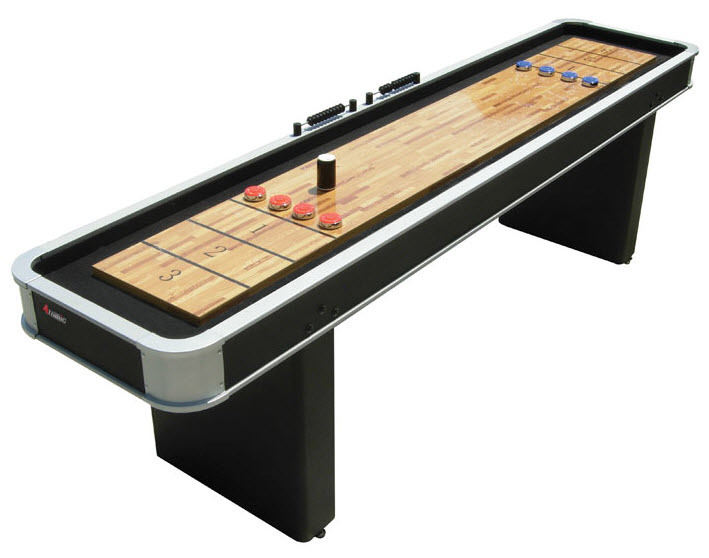 Get started by checking out some of these high quality shuffleboard tables!